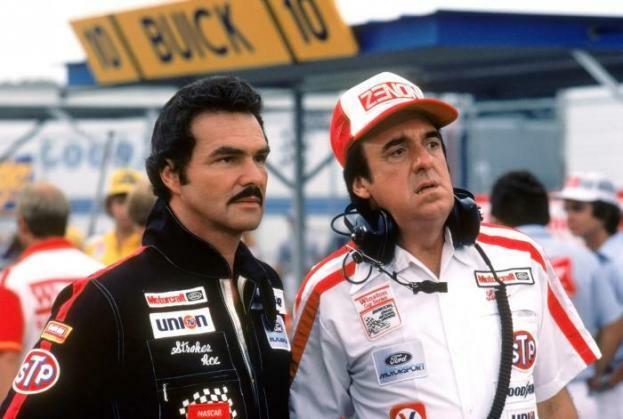 STROKER ACE—-do you think stock-car racing is an exciting sport? Will you watch Burt Reynolds in anything, no matter how flimsy the material? ‘Yes’ answers being criteria for spending your time, then maybe you’ll get some good ‘ol yucks out of this gear-jammin’ goof-off. On the other hand, if you don’t ruin your shorts at the pop of a clutch and if you maybe hope the lead actor will do something to earn his three million bucks—like, oh—act—then you can risk missing the 4th-rate idiocy concocted for this 1983 turd. Credit director Hal Needham for consistency: his movies just kept getting worse. Loni Anderson upheld her artistic integrity by playing a dumb blonde. Only Ned Beatty comes out with any professional credit intact, miraculously milking some grins out of a horribly written role (they all are), as an unscrupulous fried chicken magnate. John Byner is wasted. Jim Nabors–oh, never mind. With Parker Stevenson, Cassandra Peterson, Bubba Smith, Warren Stevens. 96 minutes. Reynolds credited this movie with finally breaking his fans loyalty. Two ‘Smoky‘s, two ‘Cannonball‘s, then this—we surrender. He skipped playing the astronaut in Terms Of Endearment to make this critter, which not only lost the fans and critics, but dumped only $13,000,000 back on a negative cost of $16,500,000. New transmission needed, son.